With the NFL Week 5 football games coming up shortly, there are still six teams that are undefeated, which is a pretty big deal as there have been less than that in the previous seasons. These teams are dominating in their games due to their various different offensive and defensive strategies, and by looking at their performance so far, we can tell just why they are winning. 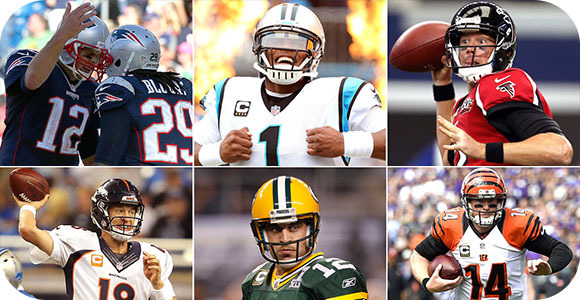 The six teams include the Patriots, Bengals, Broncos, Panthers, Falcons, and Packers; three from the AFC and three from the NFC, respectively. You can clearly see that their offenses dominate on average, and if you were to compare against the lower ranked teams, you would see a clear difference. These teams have a good pass and rush offense, which is what helps them get down the field and score more often, being able to mix up the plays to not let the opposing defense get comfortable. It helps to have amazing quarterbacks at the helm, being able to use the pocket and their options well under pressure. It doesn’t matter how well a quarterback can throw if he is unable to score, and these teams have scoring players. The New England Patriots are a great example of a great overall offensive team. With Tom Brady completing 72% of his passes, already having 9 touchdowns, and 0 interceptions is amazing; if he continues performing at this level his in on route to get 5,920 yards passing, crushing the current single-season NFL record of 5,477. Their defenses are a sight to behold. With the exception of the Falcons and Patriots, although they simply out-score their opponents, the defense is able to hold their opponents to an average of less than 20 points per game. This is crucial, having an average to great defense will ensure an easier time for the offense, and as these teams have amazing offenses, it simply creates what we have now, undefeated teams. Now, will these teams be able to continue their winning streak or will it come to an end. It is more than likely that teams with a weaker rush game will falter further down the road when they meet up against a good pass defense, like the St. Louis Rams; whose defense is ranked #1. This is what has given them those two upsets so far, their overwhelming defense; yet their offense hasn’t been able to perform up to par, so they are left behind. With some tough football games ahead of them, we may see some falter while other overcome their obstacles.